The public's anger about Muni is reaching a boiling point. Just yesterday, word came around from the Chronicle that Muni's two thousand unionized drivers rejected a proposal that would spare the agency the painful cuts and fare hikes that will hurt our city's citizens. Vote count: 575 said yes to the offer, 857 rejected. Only 1,432 voted out of their 2,000 membership (yeah, that shows real unity when only 71% vote). If the union voted in support, Muni could save $15 million by having their drivers make some minor sacrifices and changes in their working policies. Grumble grumble grumble. It's interesting to note that Mayor Newsom, SFMTA Chief Nat Ford, union head Irwin Lum, and the union's executive board worked fought tooth and nail to work on a decent deal; the union membership just kicked management and it's citizens in the nuts. I'm a unionized employee too, and we understood that taking furlough and pay cut was necessary to keep our jobs and let our university students be able to have open classes. 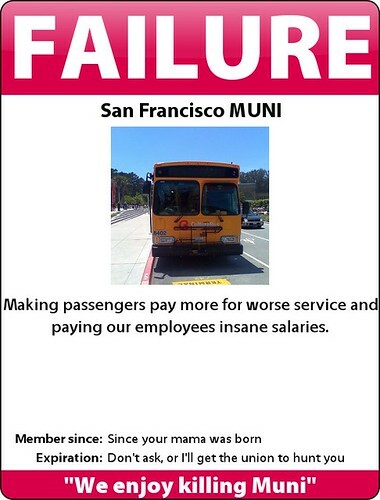 Why can't this go through the brains of the unionized members of Muni's drivers? Muni will die a painful death (they are crying in agony and begging for morphine right now) unless serious changes happen without screwing the customers again. I don't think it will get through their heads until real action is taken. Union or not, it is a government agency. What if the government decides to sell this mess to the highest bidder? Or, as a gov't entity, some of these negotiations get put on the ballots. I am hoping this happens, and that SF people get their arses to the polls. I have seen the good unions can do, but this is all very, very damaging.